“A fascinating portrait of activism deepened and sustained by Herculean labors of research and investigation.”—The Nation Historian Kevin Starr described Carey McWilliams as "the finest nonfiction writer on California—ever" and "the state's most astute political observer." But as Peter Richardson argues, McWilliams was also one of the nation's most versatile and productive public intellectuals of his time. 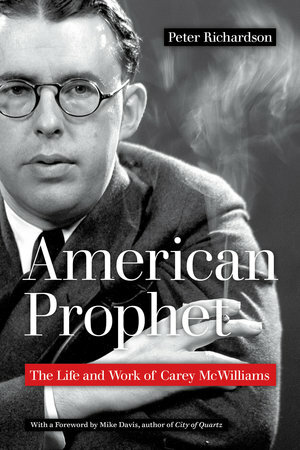 Richardson's absorbing and elegant biography traces McWilliams's extraordinary life and career. Drawing from a wide range of sources, it explores his childhood on a Colorado cattle ranch, his early literary journalism in Los Angeles, his remarkable legal and political activism, his stint in state government, the explosion of first-rate books between 1939 and 1950, and his editorial leadership at The Nation. Along the way, it also documents McWilliams's influence on a wide range of key figures, including Cesar Chavez, Hunter S. Thompson, Mike Davis, screenwriter Robert Towne, playwright Luis Valdez, and historian Patricia Limerick. Peter Richardson teaches humanities and American studies at San Francisco State University. His books include A Bomb in Every Issue: How the Short, Unruly Life of Ramparts Magazine Changed America and No Simple Highway: A Cultural History of the Grateful Dead.